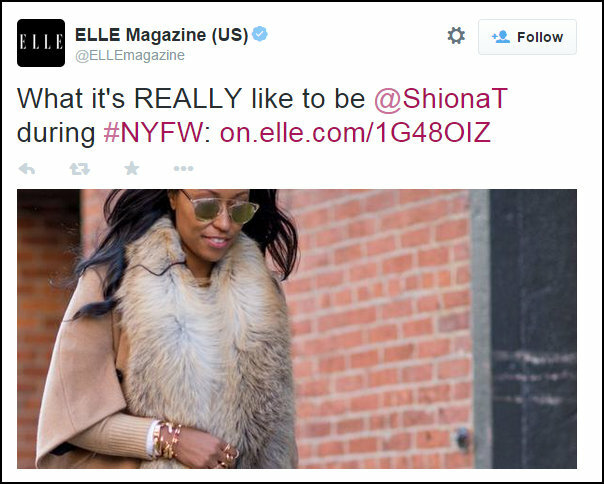 Calling her a “street style star,” international fashion magazine Elle has featured Bermuda’s Shiona Turini as she shares details about her daily life during New York Fashion Week [NYFW]. The Hampton University graduate has been a style connoisseur since her days in high school, and has gone on to become one of the island’s most successful fashionistas. “I had an early lunch meeting with jewelry designer Kristen Gipson Crawley of Kdia Jewelry at The Mercer hotel. It was freezing out so we ordered the soup, which was amazing. In recognition of NYFW, Ms. Turini also found her way into the New York Times, with the publication featuring a photo of her in its coverage of the event, while her personal shopping tastes were used to highlight products by online retail giant Amazon. The Bermuda Fashion Festival recently announced that Ms. Turini will be one of their partners for the 2015 festival, which is set to be held from July 6 – 11. Ms. Turini isn’t the first island personality to make their way into Elle’s pages , with the magazine previously featuring current Miss Bermuda Lillian Lightbourne in their June 2012 edition, as well as in a multi-page spread in the July 2013 South African edition of Elle. Well done my beautiful niece. We have the same eating, and love of life flair! Keep moving!